UPDATED: Sat., June 16, 2018, 6:20 p.m.
Perhaps it was the proverbial seven-year itch to do something different, or a chance to spend more weekends with my wife. Either way, I’m now the K-12 education reporter for The Spokesman-Review and no longer covering Eastern Washington University sports. I’m ready to make some new memories, but can’t resist reminiscing about my favorite stories during seven years of covering the Eagles. No surprise, but it was more about the people than the games, the moments away from the field and the court that resonated with me more than the last-second heroics. But those were fun too. 2012: A star is born. Before he became an All-American, quarterback Vernon Adams Jr. was on the Eastern scout squad. During an All-American career, Vernon Adams helped the Eagles win three straight Big Sky Conference titles. He also went 4-0 against archrival Montana. The first came at Roos Field in the fall of 2012, with the winning score coming in a fashion that Adams would make famous: he scrambled, then scrambled some more before finding Ashton Clark for a 20-yard touchdown. A few days later, Adams tried to grasp his newfound fame. 2013: EWU beats 25th-ranked Oregon State. FCS teams aren’t supposed to beat Power-5 schools, certainly not ranked ones, and definitely not after an eight-hour bus ride. But the Eagles defied the odds, the heat and even dehydration to knock off OSU, 49-46, in the season opener in Corvallis. It was the first college start for Cooper Kupp, who scored two touchdowns, and the biggest win yet for “Big Play VA,” who threw for 411 yards and ran for 107 more. “It was all just so much fun,” said Adams, who three days later was receiving votes for the Heisman Trophy. 2013: Anthony Larry finds his way back. There was no way to sugarcoat it: Larry, a defensive end, had lost his way in the classroom. Then he lost his football scholarship. “I really didn’t even want to go to the games, because it hurt so much,” he said of the 2012 season. But Larry didn’t lose his way; instead, he paid his dues – and his own fees – to make grades and get back on the field, and later graduate. 2014: Eagles win 52-51 thriller at Montana State. Hands down the best game I’ve ever covered. With the Eagles trailing by 51-44 and the Bobcat crowd of 19,000 in full roar, Adams took the Eagles 80 yards for a touchdown. Then he took it in for the winning two-point conversion. Along the way, Adams faced a fourth-and-10, but found Kendrick Bourne for a big gain – that’s when I knew the Eagles would get it done. 2014: Cody McCarthy gives it all for the team. Winning means sacrifice, and few Eagles gave up more than middle linebacker Cody McCarthy. He had surgery on both knees, a skiing accident that almost cost him a leg and a sudden onset of Type 1 diabetes that left him comatose and 40 pounds lighter. Yet he played on. “He’s tougher than nails,” said assistant coach Josh Fetter, who found a teary-eyed McCarthy in the locker room after a career-ending playoff loss. 2015: Eagles go dancing for the first time in 11 years. Program-building, coach Jim Hayford called it, when he took over a struggling program in 2011. Less than four years later, the Eagles were dancing. For fans, the moment was even sweeter because it came on the home court of rival Montana, from 11 points down with barely six minutes left. “We’re a big family and we never think we’re out of a game,” said point guard Drew Brandon, who along with Tyler Harvey and Venky Jois led the Eagles to NCAA Tournament. 2016: Eastern wins Big Sky soccer title. This was the ultimate worst-to-first story, as coach Chad Bodnar took a last-place program and turned it into a champion in just three seasons. Led by forward Chloe Williams, the Eagles finished fourth in the regular-season, but got to host the postseason tournament when Idaho’s field was too waterlogged. The Eagles made the most of the opportunity, overcoming snow and Northern Arizona in a gut-wrenching penalty-kick shootout. When it was over, half the football team joined the soccer players in celebration. 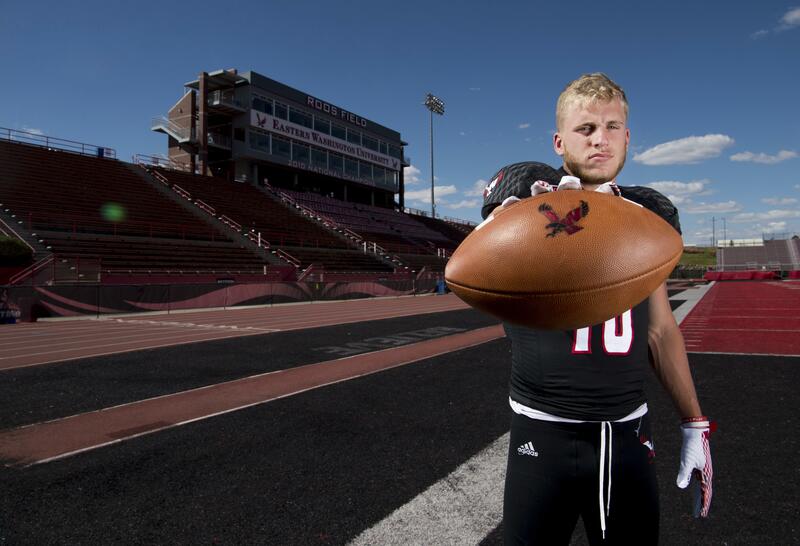 2016: Cooper Kupp, a life of faith, family and football. The best wide receiver in Eastern history is much more than a football player. From his redshirt freshman year to the final game, I covered his entire career, and he played far beyond the confines of the football field. “School is great, but it’s the relationships that have made it special for us,” Kupp said. 2017: Wendy Schuller, a mother on and off the court. “I have the two best jobs in the world, being a mom and a coach,” Eastern women’s basketball coach Wendy Schuller likes to say. She does them both with passion, fielding a winner on the court, the classroom and at home. Published: June 16, 2018, 5:56 p.m. Updated: June 16, 2018, 6:20 p.m.